In our recent blog post we spoke about creating sites without using templates. This article is a guide to understanding your template choices if you choose to use one. Trying to figure out which template to use is as deciding on which candy will fulfill your sweet tooth craving. For the same reason stores carry many candy options, SharePoint developers decided to provide many templates to fulfill all user needs. 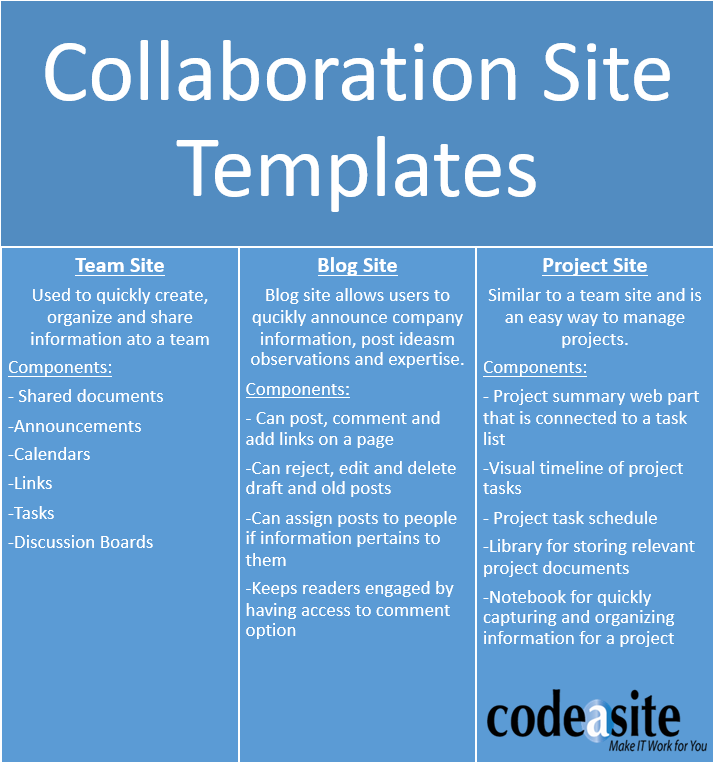 The types of templates available can be broken into 3 different sections: Collaboration Site Templates, Enterprise Site Templates, and Publishing Site Templates. We created some simple to read charts so you can learn more about the different site templates available. 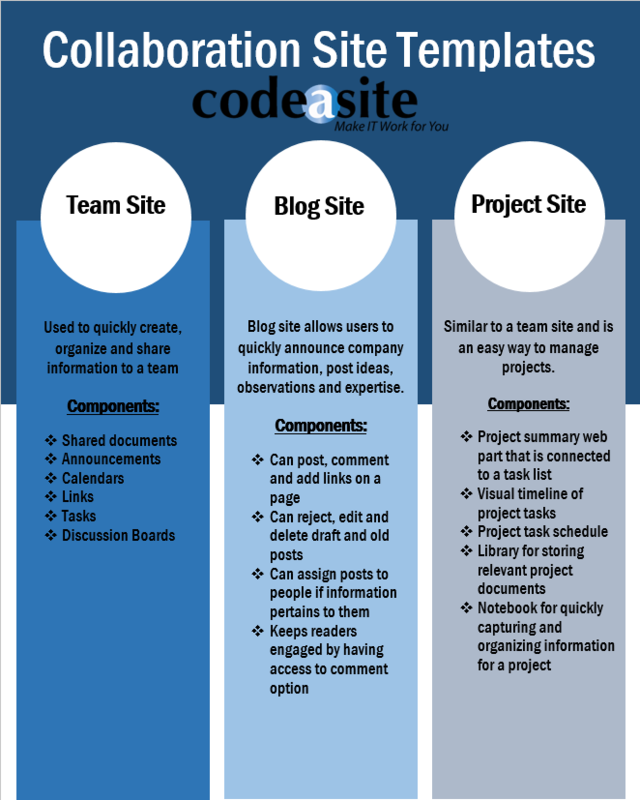 When creating sites for increased company collaboration there are 3 site templates: Team Site, Blog Site, and Project Site. Team sites use intranet software to help with organizing information that needs to be shared with a team. Intranet developers created blog sites to allow users to quickly announce information to a company. Lastly, Project sites work similar to team sites and can help with managing team projects. For a better breakdown of these sites click below. For your business needs to will want to use an Enterprise Site Template. 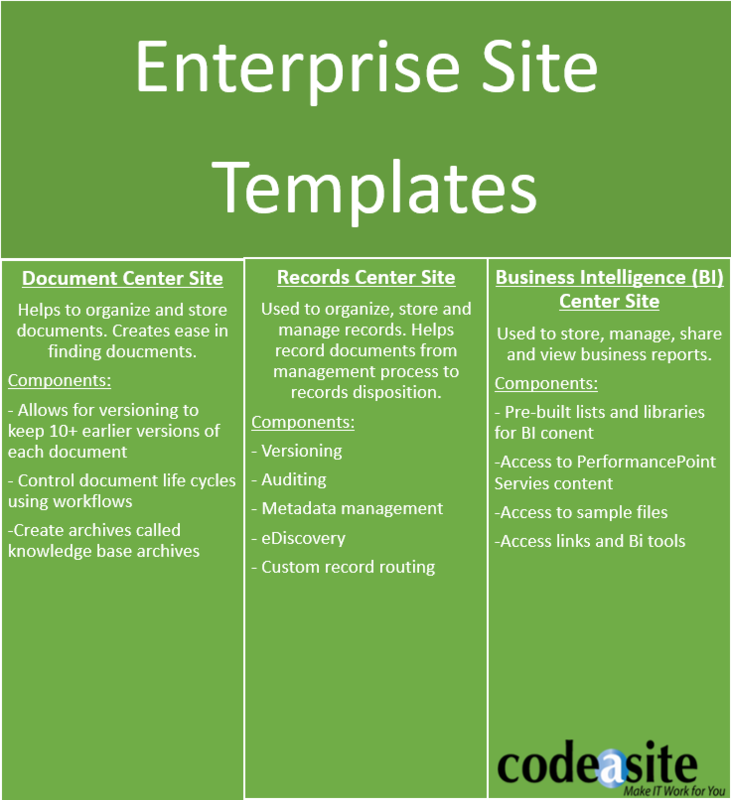 Three types of intranet templates that fall under the enterpise category are: Document Center Site, Records Center Site, and Business Intelligence (Bi) Center Site. Document Center Sites can effectively organize files as well as control document life cycles. Records Center Site organizes, stores and manages records. If you want a way to store, manage, share and view business reports you should use a Business Intelligence Center Site Templates. Looking for an easy way to compare these templates, check out our chart. 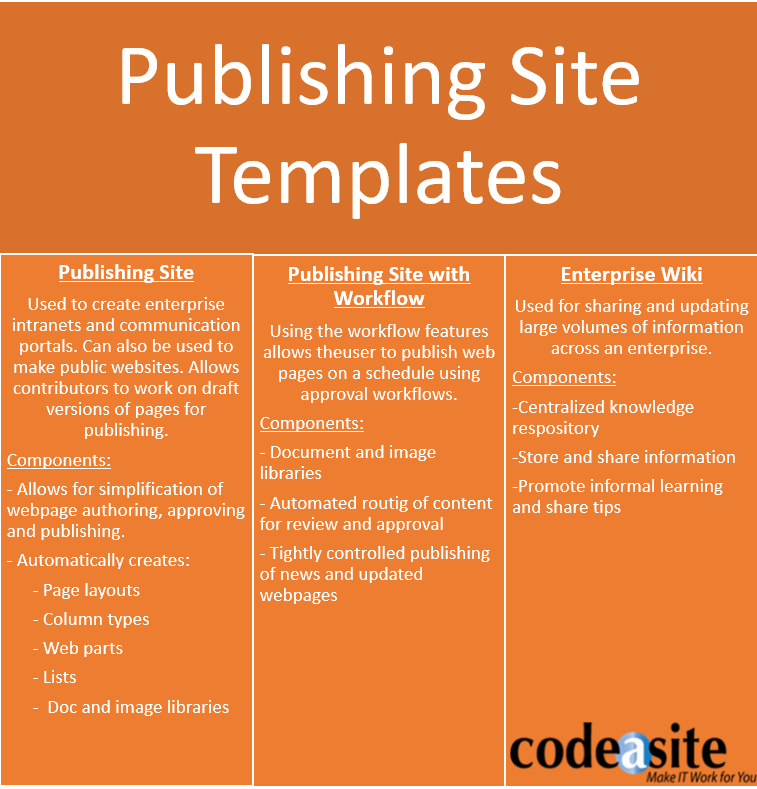 Publishing Site templates are helpful when creating enterprise intranets and communication portals. There is also an option to have a Publishing Site with a Workflow, the workflow allows for pages to easily be published post proper approval. Lastly, the Enterprise Wiki Template can be used for sharing and updating large volumes of information. Loving this intranet software but want more help? Hopefully this article helped you to understand site template options. SharePoint services can be great for any company as long as they are used properly. Want help with using SharePoint or learning about intranet software? Code A Site has a great team of SharePoint consultants ready for your call or email!